Handcrafted black porcelain box edged in 14-karat gold-plate. 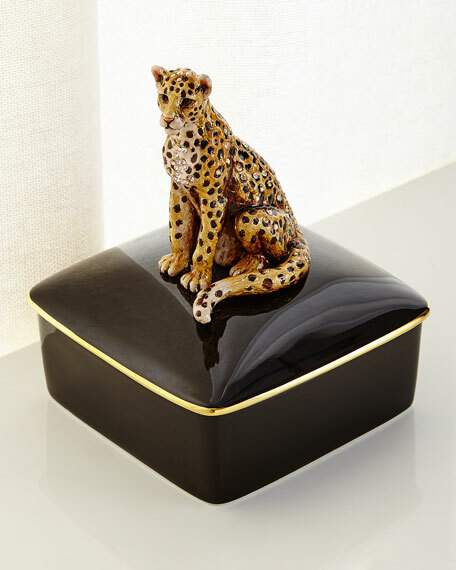 Top is adorned with a metal sitting leopard figurine that has been hand-enameled and set with Swarovski® crystals. Handcrafted porcelain box from the Brocade Collection. Lid topped with hand-painted 18-karat gold plated, hand-molded flowers embellished with crystals. 10"Dia. Handcrafted porcelain box from the Brocade Collection. Lid topped with hand-painted 18-karat gold plated, hand-molded flowers embellished with crystals. 10"Dia. x 4"T. Made in the USA. Handcrafted heart-shaped box of porcelain. Enamel flowers hand-set with Swarovski?? crystals on removable lid. 18-karat bright gold; light brown antiqued finish. 4.75"W x 4.75"T. Imported. Handcrafted Elliott seahorse box. 3"W x 2"D x 6"T. From the Oceana Collection. Intricately hand-enameled and hand-set with Swarovski?? crystals. Handcrafted Elliott seahorse box. 3"W x 2"D x 6"T. From the Oceana Collection. Intricately hand-enameled and hand-set with Swarovski?? crystals. 14-karat matte gold-plated detail with touches of antiquing. Crafted of lead-free metal. Made in the USA. Handcrafted Gavin crab box. 5"W x 4"D x 3"T. From the Oceana Collection. Intricately hand-enameled and hand-set with Swarovski?? crystals. Handcrafted Gavin crab box. 5"W x 4"D x 3"T. From the Oceana Collection. Intricately hand-enameled and hand-set with Swarovski?? crystals. 14-karat matte gold-plated detail with touches of antiquing. Crafted of cast pewter. Made in the USA.